We are excited to announce that Housing & Residential Education is growing! 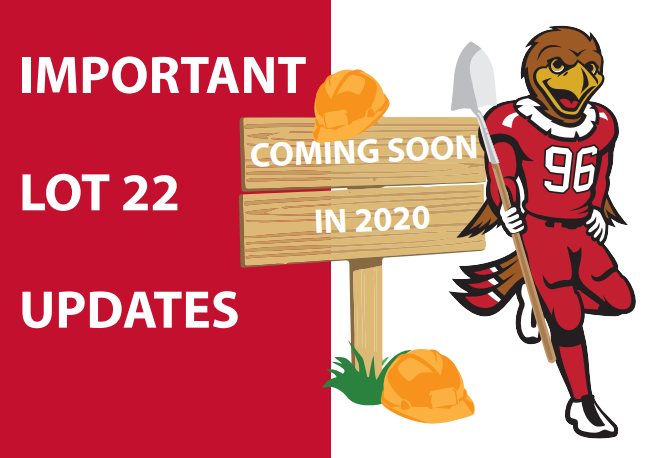 Starting this fall construction will begin on HRE’s newest residence hall set to open Fall 2020. This new residence hall will be constructed just West of the Marriott Honors Community. Beginning on November 15 the parking lot (Lot 22) outside of the MHC be closed and unavailable for parking. This page will continue to be updated with updates related to the construction project. 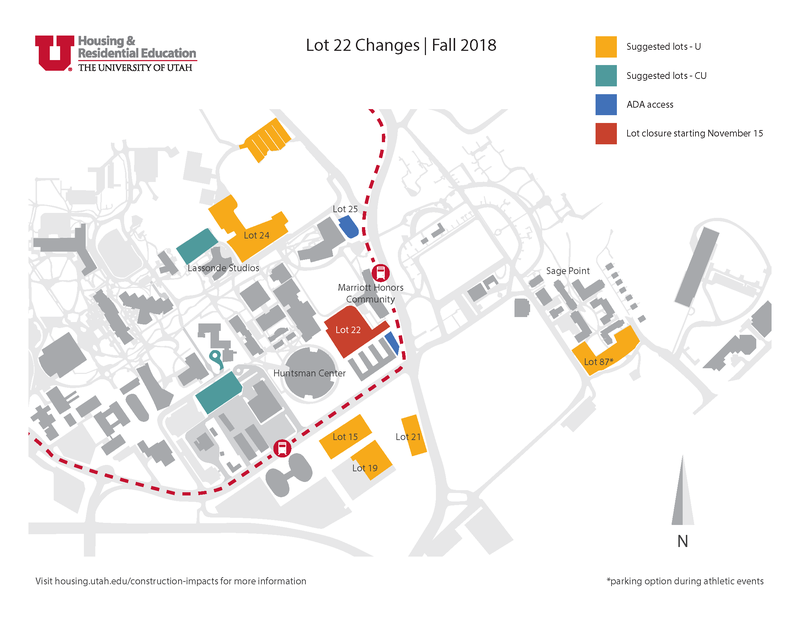 See below for maps indicating details of the Lot 22 closures, an alternate parking map, and additional FAQ information. Please note that the alternative recommended lots are for housing residents with a Zone 1 permission. Parking Update: Parking Lot 21 is no longer available for overnight parking. Residents can park overnight in Lot 15 on level 2 and level 3 of the structure. Lot 15 is not available on weekends or during events. On event days, it is recommended that students park in Lot 24. Parking lots 19 cannot be used on Sundays. These lots will be used by patrons of the Institute each Sunday, and we ask that you move your vehicle. You may alternatively park in Lot 15 or in the Business Parking Structure on Sundays (regardless of permit type), but please be aware that required permits are necessary for these lots starting on Monday mornings at 8:00am. The large concrete pour has been rescheduled for Saturday, February 2. This concrete pour is scheduled for very early morning and will begin at 3:00am. Residents of the MHC are encouraged to pick up noise reduction foam boards, white sound machines, and sleep kits from the MHC Front Desk. All trash chutes in the Marriott Honors Community have been closed due to new dumpster locations outside of the building. All residents in the MHC should dispose of their trash by taking it out to the dumpsters located on the Southeast side of the building. Sound machines, noise boards, and sleeping kits available! As construction and concrete pouring picks up, the construction sounds around the MHC may become louder. All residents are welcome and encouraged to pick up noise reduction foam boards, sound machines, and sleeping kits from the MHC Front Desk. The construction fence around the Huntsman Center parking lot will be going up on October 31. The project has been adjusted to support students and staff/faculty to be able to utilize the lot through the month of October. Access to the parking lot will change on November 15, and all cars will need to be relocated by 11:00pm on November 14. *These dates are subject to change. Trash and Recycling chutes will be open until further notice. Dumpsters will be located near the building. 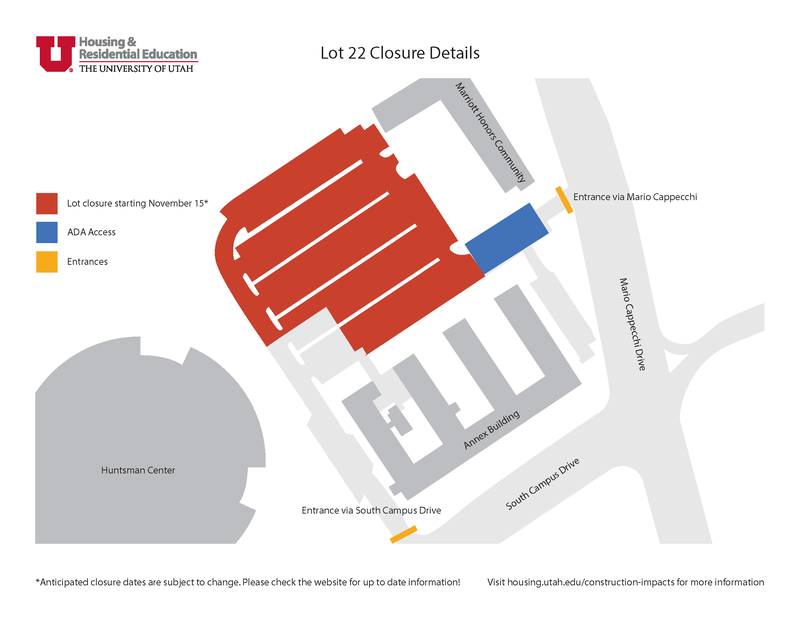 A large portion of Lot 24 will be inaccessible starting in November- review exact closure here. Access to the remaining accessible parts of Lot 24 can be accessed through Student Life Way. As a result of Lot 24 limited parking, additional U parking has been added in Lot 19 (the surface lot directly south of the Institute Garage). Only part of the lot is still reserved for Institute permits, and there are signs identifying which are is U permit parking. Review this interactive parking map for the most up to date changes and zoom in on the appropriate map as needed. Students who want to be considered for the Central Garage in the Business Loop (CU Permits only) need to add themselves to the wait list on the Commuter Services website. This is accessed by going to the Commuter Services page, scrolling down to Manage Waitlist, and signing up for the waitlist.